Still fishin', but after a nice dinner of fresh caught bass, I felt sufficiently fortified to get this post out. I was looking for some way to lend gravitas to the enumeration of this, the second of the official Carnival of Divided Government posts, and have settled on Latin ordinals. So without further ado, welcome to the Carnival of Divided Government Secondus (if anyone can advise me on the Latin translation of "Carnival of Divided Government", we can get really pretentious for the next round, which - BTW - will be in two weeks on October 16). "For investors, the return to divided government -- and political gridlock -- could be a mixed blessing. Investor reaction would likely be driven "by perceptions of whether or not congressional action is seen as necessary to help address budget deficits or other emerging economic imbalances, or to keep the country aligned toward free trade and manageable tax and regulatory..."
"One risk we wouldn't worry too much about is the upcoming elections. Investors already know that there's a decent chance that the Democrats will capture at least one house of Congress, and they've continued to bid up share prices. So the risk, if you want to call it that, of supposedly free-spending, tax-raising Democrats taking power is already baked into stock prices. Besides, the GOP would still control the White House, and markets would probably welcome divided government, one that's unlikely to do anything that could harm businesses or the economy." "The rules of partisanship imply that a Big Government scheme proposed by a Republican president is more likely to be accepted by a Republican Congress than if it were proposed by a Democrat. That's exactly what happened with the Medicare drug benefit... One thing we have seen, however, is that Bush, like all politicians, is a political animal. On domestic policy, he usually cares more about scoring one for his own team than upholding a coherent position on the role of government in a free society. I suspect the president would go hunting for his veto pen more often if he were faced with a Democratic House. And imagine how congressional Republicans would fight the sorts of big government schemes they currently push if those proposals came instead from the mouths of Democratic majority leaders. 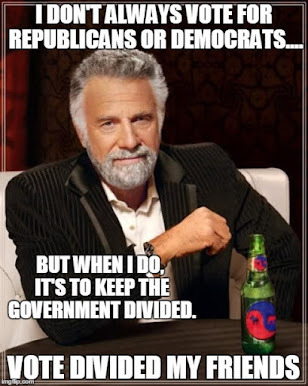 Divided government isn't a cure-all. But I'm willing to entertain the notion that those who value limited government would be at least no worse off under it than they are now." "Virginians also expressed some desire for dividing government power in Washington between the two parties. The poll found 42 percent of Virginia voters saying they preferred divided government, 36 percent saying they preferred one party to be in charge, and 23 percent not sure." "Things have changed dramatically in the last 24 hours. The spying bill has become something of a hot potato. The House and Senate can't agree on a final version. It's possible no vote will be held before adjournment in either the House OR the Senate. That would exceed our expectations... The post-election landscape will change. 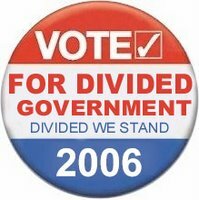 We could have divided government. If so, the bill dies. If not, the bill may still die as Republicans prepare for 2008 by distancing themselves from an unpopular President. " Looks like a noble endeavor, and Jim is having an impact. You can help him tilt at these windmills by contributing here. I have posted on the torture bill before. Unquestionably it is a choice between the lesser of two evils. The bill passed by the Senate is bad. The President's original bill was far, far worse. Joe Gandelman weighs in with "Senate Gives Bush His Controversial Terrorist Detainee Bill" at The Moderate Voice. "Because the Congress is totally under Republican control authentic oversight and advise and consent has been lacking. It's a case more than ever for voters — including traditional conservatives who are descendants of Barry Goldwater — to opt for ending the experiment in total one party rule ... Question: will this turn off independent voters? Will concerned independent voters, traditional conservatives, and moderate to center-left Democrats who don't like being told their party wants to protect people who want to butcher Americans decide no matter what they will cast their votes in this election to ensure there is divided government and authentic advise and consent for the next two years?" "This November the Democrats need to win at least the House of Representatives so that America can gain what it has desperately lacked since 1994 and that's a divided government. In this bloggers opinion the Democrats have been very disappointing since Bush's approval ratings started to fall. Until this party can get its act together and oust Harry Reid and Nancy Pelosi I don't see the Dems making a serious impact in the post-election landscape." "I know that no one expects the Democrats to sweep the Republicans out thanks to gerrymandering districts and the money imbalance. But, you know something? It might happen... Or, they could end up with a divided government and no veto-proof majority; if there is someone with some fire and some credibility in each house to lead, things could get interesting." Jay presents "A Dozen Reasons to Vote Democratic": in the Diatribes of Jay. Among his reasons is number 10: "To restore fiscal discipline to Congress, if by no other means than divided government." "I have no particular desire for Democrats to control Congress. What I want is a Congress that is willing to do its job and serve as a check on the Executive Branch. I want a Congress that can actually say “no” to the President. Ever. For me, this has never been about one party or the other. The real question of this election is do we want one person in charge of the whole country? If you answer yes, you should reelect the people who are sitting in Congress today. If you answer no, it’s time for some changes.... 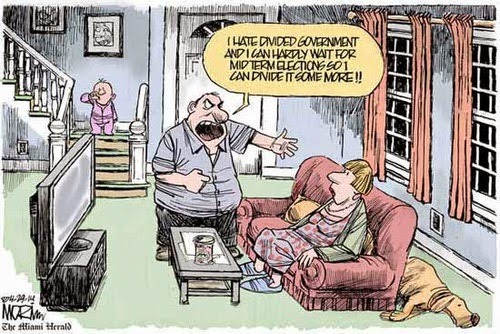 I am all for gridlock and divided government." If I am not mistaken, this next post is from Mark Parkinson, who changed his party affiliation and is running for Lt. Governor of Kansas as a Democrat (Mark - you might consider putting your name somewhere ... umm ... anywhere on your blog, after all, you are running for political office). Mark posts in his blog Decline and Fall some comments on the virtues of Divided Government in "The Show Must Not Go On", and "The Resurgence of the RINOs". "It was a nice Republic, pity we could not keep it. Strangely, this may well help the Democratic Party electorally. Having created a war without end mandate, the public may well want a divided government to preside over it, just to make sure that the corruption spatters in all direction... This is not strange - the UK put Conservatives in charge of the Labour Party's social welfare state, Jefferson's party presided over the republic that Hamilton created. Often the party that makes a particular order ends up watching as the other party runs the government." My Bubble Life presents The Democrats are Self-Destructing . . . Again posted at My Bubble Life, saying, "Why does the Democratic Party continually sabotage their success? With the momentum that they had gained a few months ago dissipating, it appears that they may have energized the President and the Republican candidates." Had to include it, as Bubbles voices the very fear that keeps me awake at night: The Dems will blow it again. Markos Moulitsas (of Daily Kos fame) presents "The Case for the Libertarian Democrat" at CATO Unbound. He posted on this topic once before on his site (which prompted me to join DAILY KOS just so I could add the widely unread 900th and final comment). This essay is deserving of a more detailed response, which I hope to get to in the next week. But for now, it boils down to this question: Where is "true north" for you politically? Are you a libertarian first and a Democrat or Republican second? Despite the title of his essay, I'd suggest that Kos is a Democratic Libertarian-lite. For Kos, Democrat comes first. For me, freedom is true north, and Democratic or Republican parties are purely a means to an end. Net net - Voting for Democrats in '06 is a practical, tactical voting strategy to slow the advance of the state by eliminating the continuing disaster of single party control of the executive and legislative branches, and imposing the additional check and balance of partisan balance on the levers of power in Washington. I previously outlined this tactical voting strategy in the post: "Hand wringing libertarians." With that we conclude this edition. Submit your blog article to the next edition of carnival of divided government using our carnival submission form. Past posts and future hosts can be found on our blog carnival index page. Technorati tags: carnival of divided government, blog carnival, divided government. Decline and Fall is not operated by Mark Parkinson. I'm just an ordinary guy who recently switched parties. I can't, for professional reasons, link my identity with Decline and Fall. Just so you know, I ofund this link through Technorati. Sorry about that. My mistake. Unless I hear from you, I am going to just leave this as a correction in the comments. If I change and republish the post, I think it'll just give the post a higher priority with the search engines. But if you prefer that - let me know.